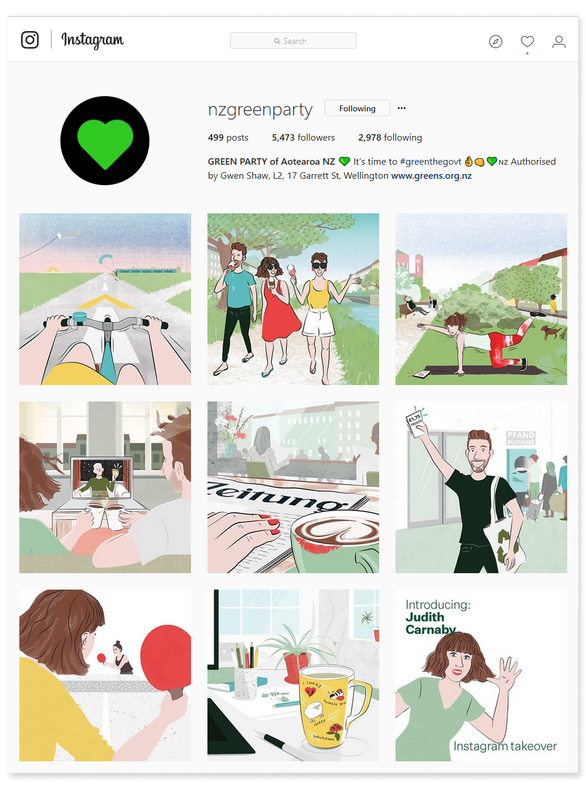 I was invited to create illustrations for an Instagram takeover for the Green Party of Aotearoa New Zealand, as part of their marketing campaign in the lead up to this year’s general election in New Zealand. The ideas, opinions and illustration concepts are all my own! Included below are the texts I wrote to accompany the images. Hallöchen! I’m Judith Carnaby, coming to you from Berlin, Germany. 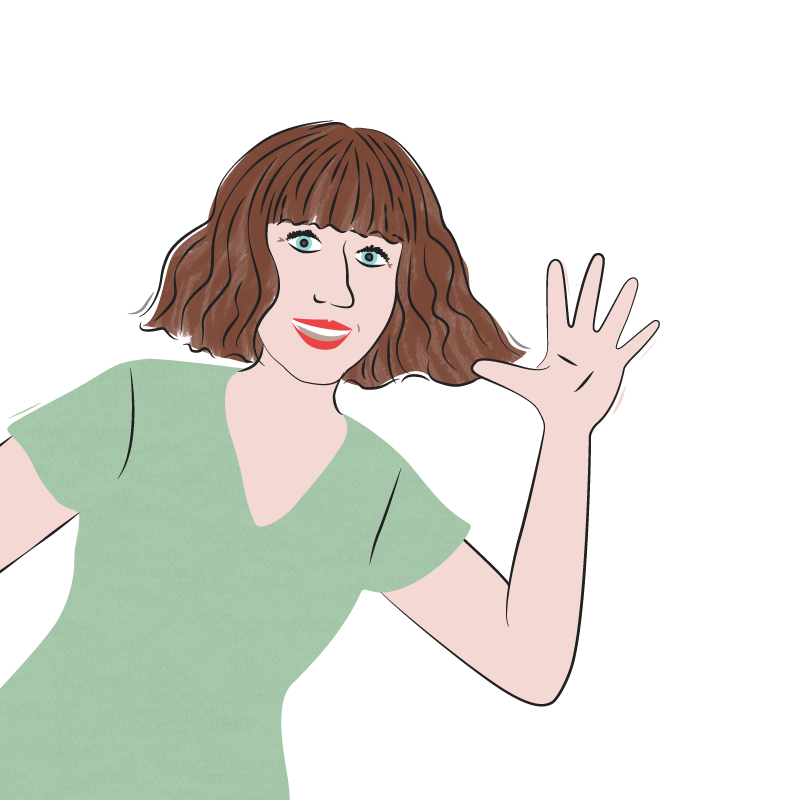 I’m an illustrator and writer on illustration, and I’m going to take you on a quick OE to see my life here in der Großstadt. I grew up in a small town near Christchurch, and, after a couple of stops in Auckland and Latin America, I’ve been living in Berlin for the last seven-and-a-half years. It has been an amazing, stimulating and confronting experience to live in a new culture and language so different from what I grew up in. It has also given me a chance to view life in NZ through an international lens and reflect on our place in the world. While so much of my life is here in Berlin, most of my family and many friends are in Aotearoa NZ, and it’s still where I call home. As an illustrator I try to work in a way that is more inclusive, informed, critical and engaging. It is a small way I try to add my voice to the fight for progressive development. Another way is when I vote. As I am not a German permanent resident I am unable to vote here, but I can in NZ, and for me the Greens fit best with my hopes for the future of Aotearoa New Zealand – in social equality, sustainable economic development, environmental protection, support for cultural and artistic practice, and protection of human rights. Anyway, want to peek into some of my life? Let’s go! Kiwiana Kitsch. 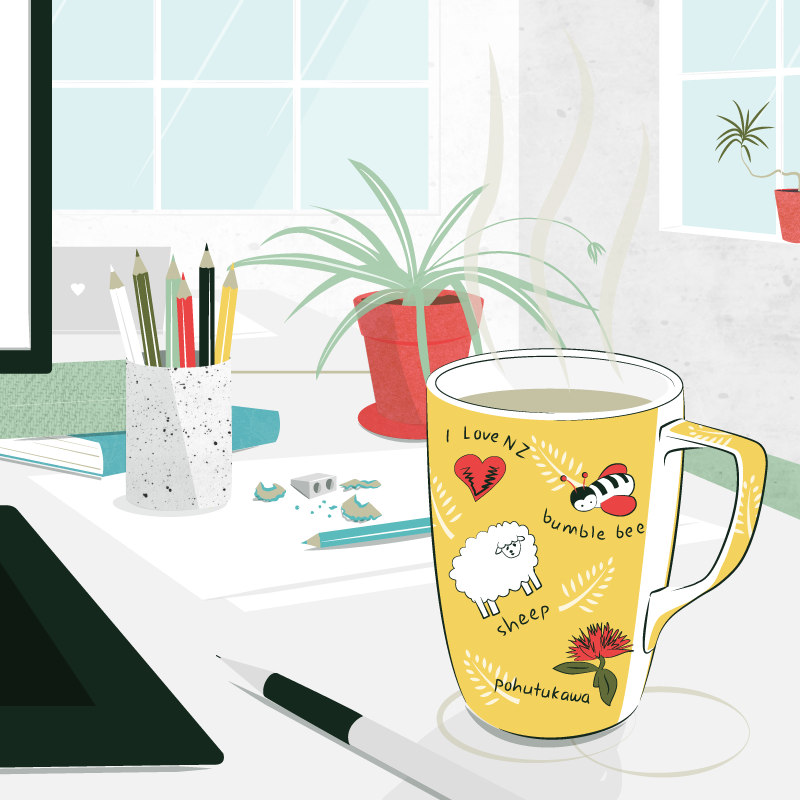 When I get to my studio in the morning, I turn on my computer and make a cup of tea. A few years ago my dad gave me this mug decorated with Kiwiana to remind me of home. As a graphic arts professional, everything about this hideous cup offends me, but I use it every day – it does make me feel closer to home. It also has the added benefit of being too kitsch for my studio mates to pilfer for their own morning coffee. Afterwork Tischtennis. 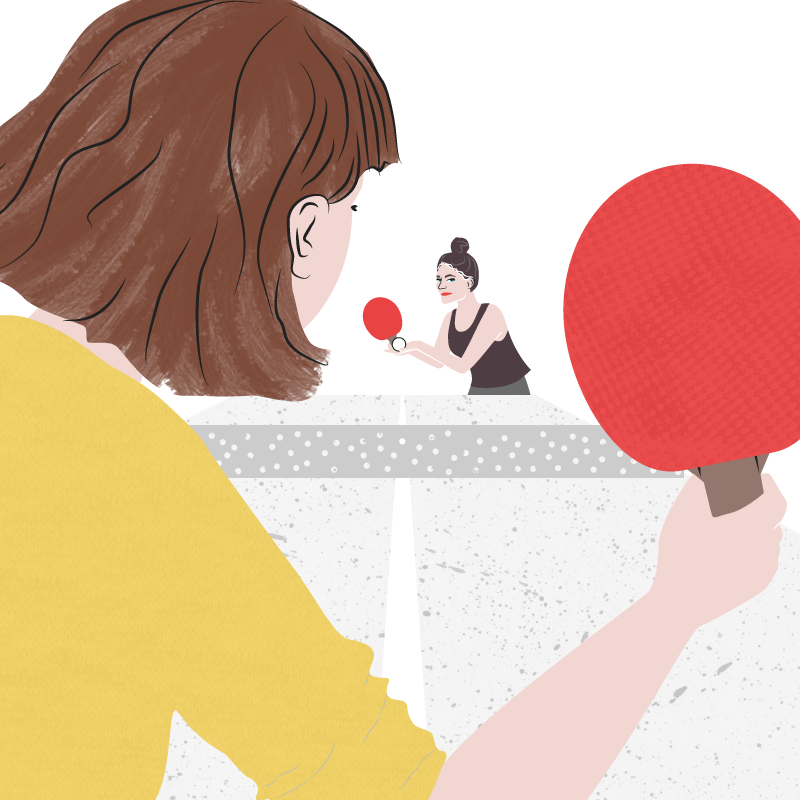 All throughout Berlin wherever there is a park, a small patch of grass, or a slightly-wider-than-normal pavement you can find a public table tennis table. Concrete table, metal net, covered with graffiti… it is such a simple thing that encourages people to get moving and socialising. Bring your own bats, balls and beers, and the game is on! I often have an afterwork hit with my buds, but after seven years of training there is no holding back. As my friend Nicky demonstrates: pure focus. Bottle Recycling. Pfand is Pfun! 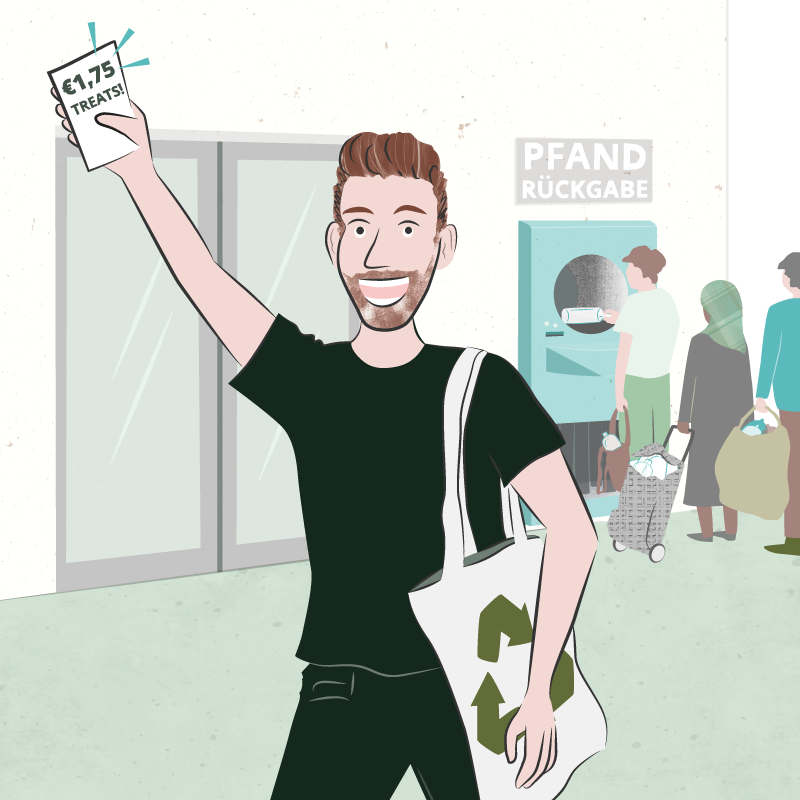 Germany is nailing it in renewable energy, and alongside rigorous waste recycling there is a great Pfand (bottle deposit) system to encourage consumers and producers to recycle glass and plastic drinks bottles. This system used to exist in NZ, and is coming back in Australia. It seems like an obvious idea to me: take back your beer bottles, they get reused, and you get money to buy more beer! Win-win. Here my husband Sam is already excited about the treats he’s about to buy with his returned-bottle voucher. 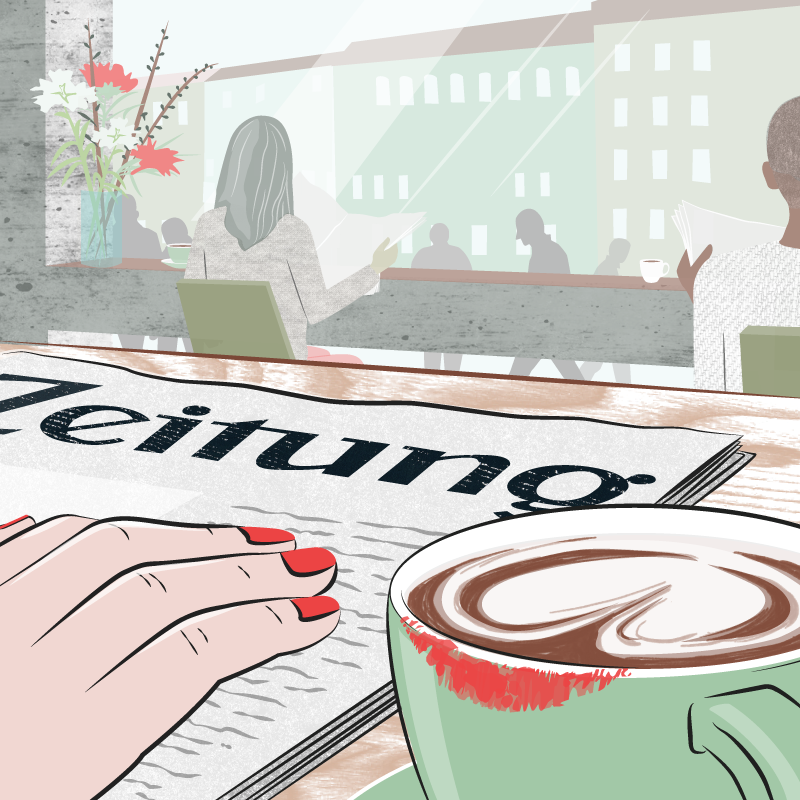 Flat white and die Süddeutsche Zeitung. Ahhhhh flat white, you glorious taste of home. Over the last five years the Antipodean approach to coffee has taken Berlin by storm. I tease my German friends for their pronunciation of ‘flet vyte’, but then embarrass myself on words like Rhabarbermarmelade (rhubarb jam). Slogging through a German newspaper while sipping my coffee makes me think of the great improvement NZ has made in support of te reo Māori. What an amazing chance it is for all NZ kids to learn a second language, understand our shared culture, and express themselves in different ways! And I’m sure it’s far, far more fun than learning German as an adult. Skyping with family. 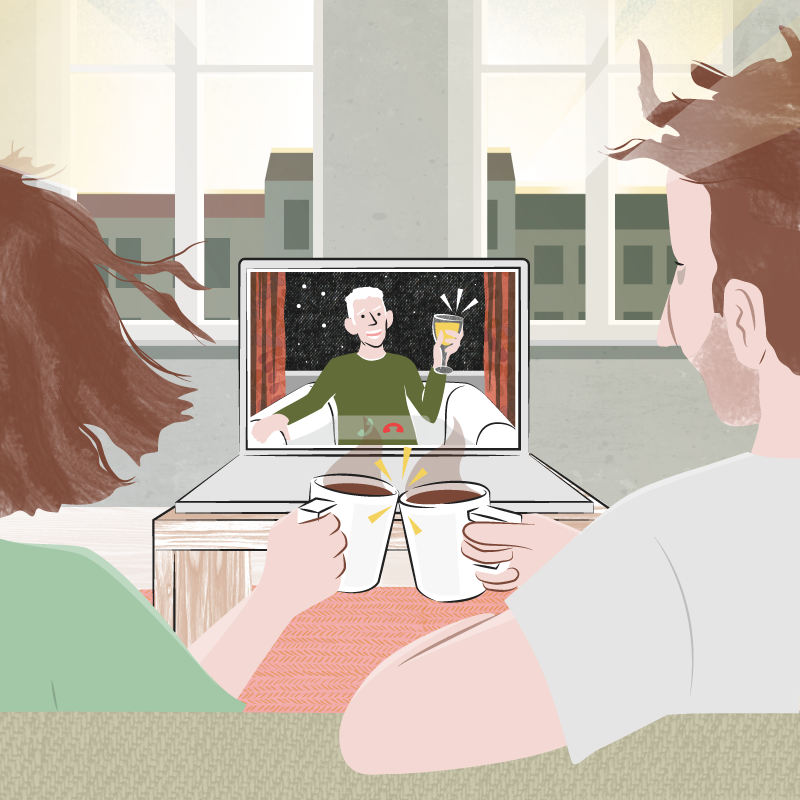 The best way to keep connected to the goings-on at home is with a slightly disorienting early morning/late evening call with friends and family. Oh yes, the time difference can sometimes be a challenge, but happily my old laptop camera softens the pre-coffee bags under our eyes. Park exercises. 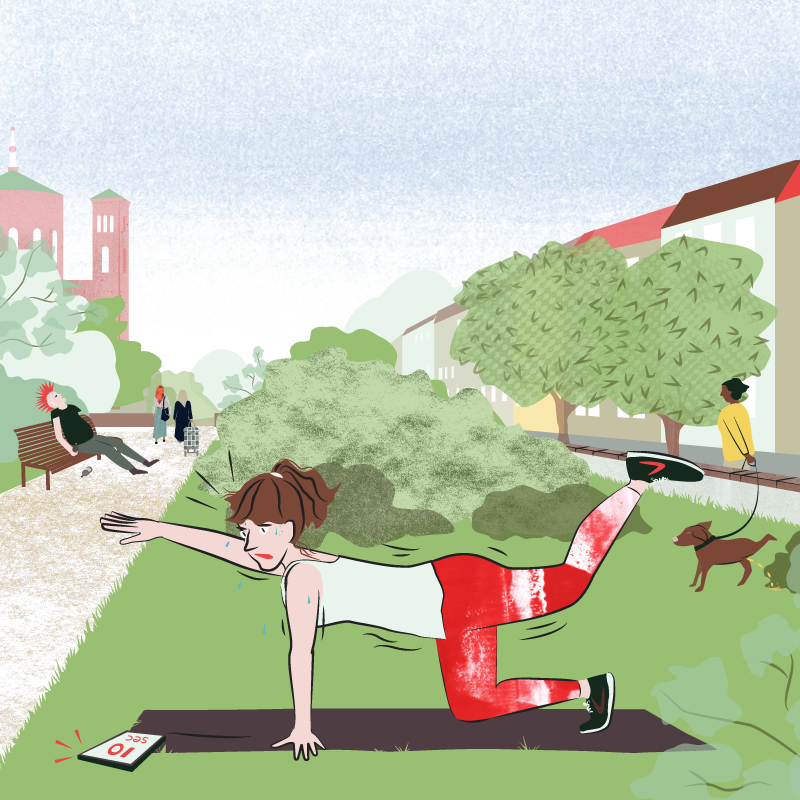 Sport, sunbathing, gossiping, performing… I love the way people use public space and parks in Berlin. Kreuzberg, where I live, is a colourful and diverse inner-city neighbourhood and I often find myself lunging among some shuffly old punks, or jogging around German-Turkish families enjoying early-evening grills. Kreuzberg’s mix of apartment/commercial/public buildings and green space feels like such a natural and efficient way to live; sharing resources, living near where you work, and connecting with a variety of people. I wish that NZ would really commit to the sustainable development of quality medium- and high-density housing, both for renters and buyers. Ice creams and Jandals. 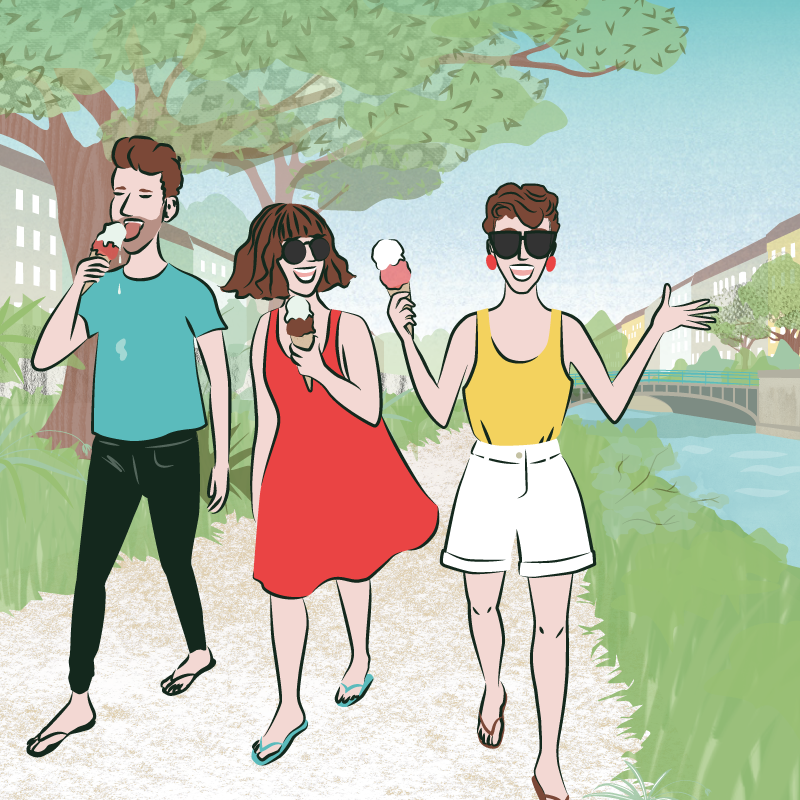 On a sunny day there is nothing that Berliners love more than an ice cream and a stroll with friends. Me too. I love hanging with my friend Conor, the Eis is delicious, and the Kreuzberg canals are lovely…. but man I miss eating ice cream at the beach! I’m so so so desperate to kick those jandals off and get my toes into the sand! Tempelhof Sunset. Berlin is a DREAM for cyclists. 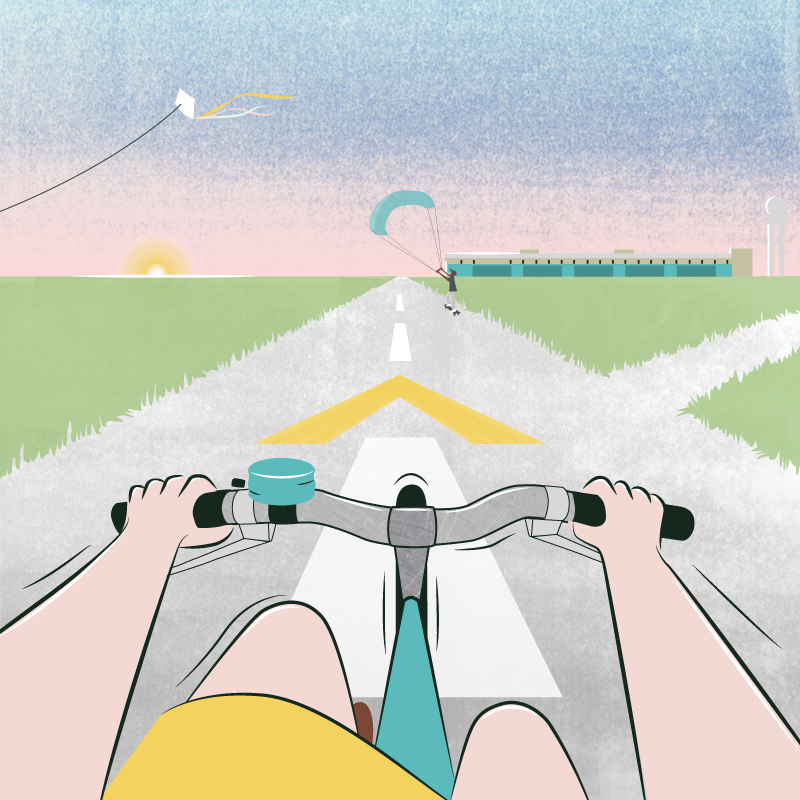 Infrastructure, respectful drivers, no hills… but the most amazing place is cruising down the runways of the former Tempelhof Airport – now an enormous public park. The former airport hangars are currently home to Germany’s largest refugee centre: 12,000 refugees have come through the Tempelhof centre in the last 1.5 years. NZ feels so far away from the Syrian refugee crisis, but with so much space and relative wealth we can and should increase our shockingly low refugee quota, alongside developing our support systems for people displaced by climate change.